Could tiny apartments be a way to lower housing prices and quickly increase the housing supply in San Jose? 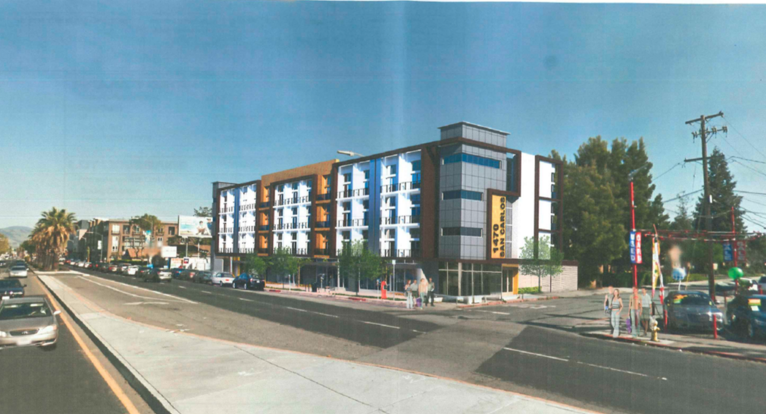 Shad Design is planning to build 81 micro units on just 0.4 acres at 1470 West San Carlos Street (currently a used car lot). This area is halfway between Downtown San Jose and Santana Row, most commonly referred to as Midtown. The plans call for three levels of apartments sitting on top of 7,200 SQFT of retail. Each floor would have 27 apartments. The units would each be 573 SQFT split across two floors--379 SQFT on the main level, 162 SQFT on a loft, and each come with a 32 SQFT closet. While small by San Jose standards, that is much larger than most micro-unit projects which can be as minuscule as 200 SQFT if you can imagine that. Ceilings will be 15 feet tall in the living room. Rent will cost about 30% less than a typical San Jose apartment, yet these units will have a full kitchen, bathroom, and even a washer and dryer. It is an interesting project and I'm sure there will be substantial demand from young workers if this gets built. Not sad to see all those used car dealers go. But when will Business Circle (Bascom & Stevens Creek) ever be redeveloped? That place is a huge eyesore on that busy corner. I am not sure anymore ground level retail is needed for the moment. The ground level retail at the the old Fiesta Lanes complex still hasn't been leased, and that is two years after the complex was finished. Ground level retail is essential for a walkable urban residential environment. I expect there will be problems if all the units are too expensive for interesting locally owned boutiques to afford and all that winds up in them is chain stores. You can't build for the needs "at the moment" anyway, because it will be a completely different moment when they are ready.